Don’t miss out on our exclusive Bundle Deal! Compliment your new bathroom TV perfectly with the Premium Bluetooth bathroom music system! It’s easy to use & ideal for when you’d rather just listen to music! Want a truly revolutionary TV experience? 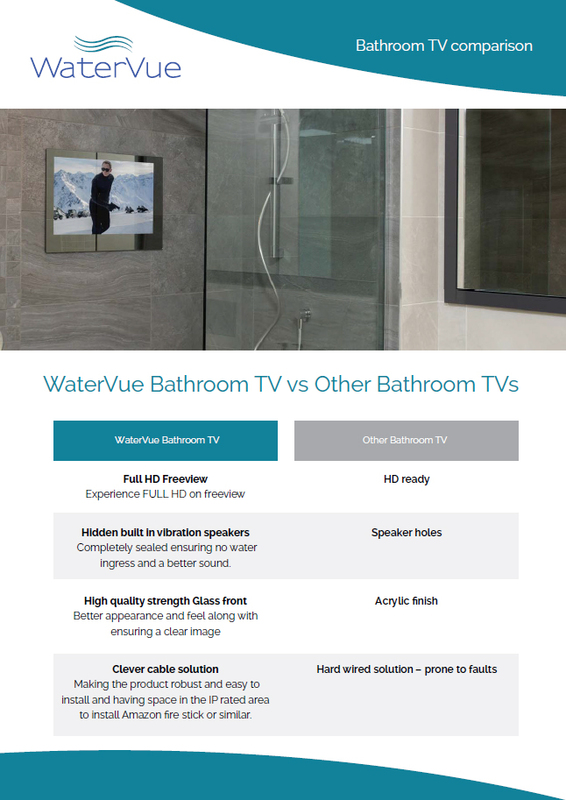 Let us introduce the incredible WaterVue 24 inch bathroom TV. It has online functionality and is bathroom zone 1 waterproof, so it’s just the thing to enhance your bathing experience. With built-in vibration speakers, a mist-proof screen and smart TV capabilities, you’ll be so entertained the bathroom will soon become your favourite room in the home! The slim design and easy install smart online TV with a cut-out dimension of 580mm x 380mm x 45mm and the front only being 595mm x 397mm x 3mm which sits flush to your tiles. 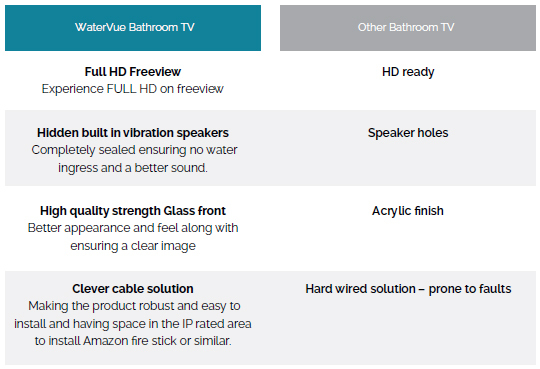 The WaterVue 24” Waterproof Bathroom Smart TV will bring entertainment to a whole new level, With A Full HD LG LED panel with fully integrated vibration speakers, giving you brilliant quality for the smallest of sizes. With built-in Wi-Fi, the Amazon fire TV stick enables you to stream online content to your TV, from BBC iPlayed and ITV Player, to Netflix and Amazon Prime. Unwind and relax to gentle music in the bath, or turn up the volume and get ready for a night out in style. Can't help imagining what your dream bathroom could be like? Well, stop imagining and start renovating! You could soon be watching your favourite shows and films in the bath with this 24 inch luxury bathroom television! With great prices, quality waterproof TVs and expert customer support, you can't go wrong when you order online today from Bathroom TV.